This guy looks like I feel in the morning … sleep! 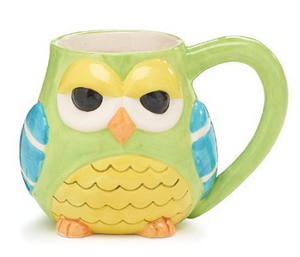 Thus the need for coffee, so fill this Owl coffee mug up, please! And, don’t forget, you can use this Amazon Coupon to save $5 Off a $25 purchase. Plus, shipping is FREE with Amazon Prime or with Super Saver Shipping on orders of $35 or more! Hand-painted ceramic owl shaped mug with white interior. Measures:4″ H x 2 1/2″ Opening.